What role did the Arctic storm play in the record sea ice minimum? While the 2012 Arctic storm was a strong one, as Newman noted, it was not unprecedented. To confirm Newman's claim, we examined daily surface pressure maps from NCEP-NCAR and NCEP-II DOE reanalysis data. Low pressure systems are typically associated with a tight pressure gradient that results in strong surface winds. In the 34 years between 1979 and 2012, we identified 19 deep low pressure systems (defined here as having a central pressure less than 980 hectopascals [hPa]) in the Arctic between 15 July and 15 September. Most of these deep lows occurred over the Barents, Laptev, and Kara seas, so they are not suitable analogs for the 2012 storm. However, there were nine previous storms during this timeframe in the same general area as the 2012 event. Of these, we identified five best analogs for the 2012 event. These occurred in 1980, 1990, 1991, 1994, and 1997 (Figure 3 - click for a larger version). Figure 3: NCEP/NCAR sea level pressure maps in (from right to left and top to bottom) on 07 August 2012, 28 August 1980, 12 September 1990, 06 August 1991, 17 August 1994, and 03 September 1997. It's a very thorough article, their examination of previous intense lows' lack of impact on the ice hammers home the role of thin ice at present. The Australian Antarctic Division (AAD) told a Senate estimates hearing today "rapid changes" taking place across the icy land mass would have significant impact on global climate. "That's the part that is the most dramatic about the information we're receiving," he told the hearing. Scientists were detecting major changes in the circulation of deep, dense salty water off Antarctica. This water, which drives the circulation of the world's oceans and in turn climate patterns, was reducing, while becoming warmer and less salty. Meanwhile, parts of the Antarctic ice caps were melting at unprecedented rates. Believe this was discussed at the time of the storm, although this did a very good analysis of what went on. Based on the general trends that was occurring before and what went on after the storm do not believe that the outcome of the melt season would have been much different. Where you would probably have seen a difference if it had not occurred (although based on projections of changing weather patterns with limited ice the probabilities of it occurring and repeat occurrences are very high) is in the longer term outcomes. Churning of the waters and farther weakening the ice will change how the freezing season will effect the ice and therefor will effect next season. Also any other storm of this strength or stronger will make farther more intense changes the Arctic ocean. My oh my. The Antarctic current is declining. Wow. I wonder, is this a delayed indicator of the failing northern driver for the current (the arctic melt), or is this separately an indication that the Antarctic driver is also dying? We are already seeing anoxic areas of ocean periodically. If the current slow dramatically, it would seem likely that we are headed to large anoxia events in the oceans much like what was seen 35+ million year ago. If that is the case, large mammals in the ocean and migratory species are in great jeopardy. If true we could/should see a return to the purple blooms of an anoxic ocean with sulfur chemistries playing a huge role and with iron being sequestered on a broad scale. We appear to be rapidly, very rapidly, transitioning to a very different world than the one we grew up in. We appear to be headed back in time climatically to 35+ million years ago. It looks like it is going to be a very bumpy ride. I hope your seatbelt is fastened and your emergency supplies are packed. As one scientist reported in that link, no, they are not being alarmist. Just reporting some interesting facts. To steer this back to the post, of course the Great Ocean Conveyor is one very big piece of the puzzle to what is going on in ASI and Arctic weather in general. I had thought the various inertial factors would give us some time before there was a possibility there could be a widespread global failure or slowdown of the GOC. If this article is close to the truth, we may be much closer to the edge than even most "alarmists" had feared. "The science behind seasonal prediction is in its infancy," said Mike Halpert, deputy director of NOAA's Climate Prediction Center. "Despite recent advances, this year's winter outlook has been difficult." Halpert added that the trend toward and then away from El Nino conditions is unique. "We really haven't seen it before. When we reach a certain threshold by August or September, we always proceed into El Nino," said Halpert. "It is incredibly unique in 60 years of data, which is a relatively small sample size." Could the freaky El Nino behavior be distantly related to the Antarctic changes mentioned above? Could it be related to the recent Arctic changes? Both at once and more besides? Yes, it could. As Neven was already getting at with his "Why Arctic sea ice shouldn't leave anyone cold" thread, the basic premise of this great blog is slightly cockeyed. It can't realistically be just "Arctic Sea Ice" when it is really about the whole dang she-bang. Colorado Bob, I can't find any details on the research mentioned in that Australian article. Nick Gales is a veterinarian who studies antarctic life. Not sure he's the horse's mouth regarding the ice sheet and its effect on climate change, even though these quotes mesh with my fears. BlackDragon "Could the freaky El Nino behavior be distantly related to the Antarctic changes mentioned above? Could it be related to the recent Arctic changes? Both at once and more besides? Yes, it could." Pretty good deduction, of which if you look at the equatorial Pacific sst's you will see a warmer sea to its North as opposed to a cooler one to its south. The winds were stronger in the South Pacific likely due to Antarctica at its peak in cold temperatures. There is more to this but this was perhaps the greatest reason why El-Nino faded. Gales may not be the expert on the Ice Sheet and its effects, but as the head of the Australian Antarctic Division(AAD), he is more than likely reporting the results of the actual experts that work within the AAD. Your inability to find anything on the effects mentioned in that article may have something to do with it recent publishing date. Since the article was only published five days ago(as I write this), the actual paper(s) may not be publicly available as of yet. Mentioned this before but this interview is about WAIS http://e360.yale.edu/content/feature.msp?id=2115. IMO ocean currents will always be there because of the Coriolis effect. What will happen is that it will become far more unpredictable. Such as going into eddies, whirls, skips, splits etc. You see this happening with the northern jet stream. You may start seeing more violent occurrences such as whirlpools or out gassings where a very large gas bubble gets trapped low in the ocean and suddenly lets go. There are some old tales that could be interpreted for that to have occurred in the past and that could be nuggets of truth to those tales. Hey LRC, looks like e360 changed the format of their links - the above link is dead. Thanks Wayne, but I can't claim anything more than a WAG on that one. Just thinking about the possible connections - connections that I am aware enough to know are there, but not knowledgeable enough, especially regarding any recent data, to posit more. I am also not familiar enough with all the relevant mechanisms to claim anything as strong as a deduction. There are others here who are making much better deductions and observations about the various changes underway. (Thinking for example of Chris Reynolds and his Greenland observations that were recently noted in the "Record dominoes 12" thread.) There are people here with the potential to dig around and find more things like this. I am not yet one of them. Do we have enough observational power to even know a fraction of what is going on out there? That quote from Mike Halpert really struck me. How can we get our science about this out of infancy, when the climate itself is changing right under out feet? Once the science is more clear about seasonal prediction, the time when those particular seasons actually existed is going to be history - meaning the PDO, ENSO, NAO and other factors that we've been analyzing historically are all going to be shifted, twisted and maybe even eradicated to some degree. And what we learned in the process of making those seasonal predictions is not going to be helpful for understanding the new state of things. We will be, in a very real way, dealing with an entirely new set of initial conditions, and an entirely new set of chaotic outcomes from such conditions. Again, this points strongly to the need for more emphasis on observation, and for less faith in modeling. Blackdragon, Halpert may be right about prediction science, its in its infancy because many believe its impossible to project long term, but that is because they never tried. Here is a guide , based on the many successful predictions I have made; timing of a prediction is crucial, the time to project is when we know what is going on. The big model based projections are machine made on a calendar based regular interval. That is wrong, a long term forecast is done right when we understand all the elements at play. 2- Sea ice thickness affects the enter circulation of cyclones about the Northern Hemisphere, very little thickness means the slow build up of winter. -> Low pressure cyclones will easily penetrate the North Pole area same as last year, this means a warmer Arctic and somewhat cooler temperate zone, as opposed to a wide variation of very cold to cool temperate winter. 3- Sea surface temperatures along with atmospheric temperatures are at all time highs->Implying great moisture events throughout the winter everywhere influenced by sea evaporation. means not steady monotonous weather for the Northern Hemisphere. 1- Like Halpert said, ENSO is in transition, never before in history has the Arctic been so warm while Antarctica more or less normal. The high probability that Antarctic sea ice extent may dwindle quickly needs be watched, and also CCN's need be observed consistently -> Wait until ENSO trend seems to be quantified. 2- while waiting for the fog of ENSO to clear, is best monitor world wide snow extent, Arctic sea ice volume and the general appearance and location of the Jet stream. -> all these will define the winter to come. 0 C with snowfall as well. Ireland and UK should have a reprieve in regular rainfall and more variable weather, North America will wonder where winter went again. The rest of The NH will enjoy warmer weather along with bitterly cold periods as Eurasia will cool down more than the Arctic. That certainly makes sense that timing is everything - enough factors have to be known before a decent projection can be made for a seasonal forecast. I imagine that some people could get fairly good at intuitively knowing both when enough factors are in place, and what the factors are cumulatively pointing to. The unfolding new AGW developments from year to year will give these folks plenty of chances to prove their worth. Especially when it is more clear that historical patterns are not very helpful any more. The people who are both open to seeing new things popping up, and can pull together a train of thought as you are getting at above, may have a decent shot at out-performing any set of models. I wonder if Neven has given any thought to the possible value of using the "successful large-scale colloborative process" of this blog, as A-Team called it in the "Record dominoes 12" thread, to someday start a more solid "Forecast Team" part of this site? - A part of the site where the collective wisdom is actually condensed into some specific seasonal forecasting (obviously taking things much further than just a couple of polls in the right hand column). "I wonder if Neven has given any thought to the possible value of using the "successful large-scale colloborative process" of this blog, "
Very good idea, we can outperform the models because they are not free to "wait out" uncertainty. Once the models can project off schedule they probably would outperform anything around. I have updated the NCOF Arctic Sea Ice Concentration and Thickness, and the MMAB Sea Ice Concentration to October 20, 2012. The methane update will come later this week, when data is available. One thing I am watching is the shift to the negative for the AO, NAO, and PNA. The US impact is a drop in temps forecasted for the central US by almost 30F. It seems that some of this shift is due to the pool of warmer water in the Beaufort Sea, which may be impacting the North American jet stream and storm tracks. I'm still suffering from blogger's block. I apologize. I'm waiting for myself to get back into shape. I'm working on a blog post that will start the next chapter, but I keep rewriting it. Can't seem to let myself catch a breath. Nothing serious, just a phase. Other than that I'm doing fine. Just struggling with the uselessness of it all, waiting for that switch in my head to flip back. I suggest he logs in with Facebook, even if he has to start an account with them. Hopefully he can go to followers and change the password or add one on his account here to log in using his email address. "I'm still suffering from blogger's block." Same here. This year seems to have left me with nothing more to say. BTW, these two comments were posted via TypePad - seems OK from my perspective. I recommend it. I'm still waiting till later in November and keeping an eye on Siberian snow advance before making any guesses about the winter to come. About 5 months ago I had a similar problem. I log in through Facebook & Fb loaded just fine, but there was some glitch between Fb and Typepad that required me to kill all my cookies (I killed history too, though this may have been overkill). The Typepad team wasn't able to log me in directly because I had originally used Fb? I could access Typepad using my wifes login on my computer, which let me know the problem was somehow in my settings. Hope this somehow helps, I know the frustration you must be feeling. Take a break, recharge the batteries. You deserve a bit of shut eye, even if seasonal hibernation is no longer an option. Thanks for contacting us, and we apologize for the problem you encountered. We are currently investigating the issue with not being able to sign in to comment impacting some blogs. Until we release a fix, you do have some options to workaround the issue. The quickest solution for you and your commenters is to enable Typepad Connect comments. The sign in bug only impacts blogs using the default commenting system. At Settings > Comments, you can scroll down to the end of the list and click to enable Typepad Connect comments. Then, you will be able to sign in to comment without issue. Another option is to simply make sure to check the "Remember Me" box when you sign in to Typepad. After clicking the "Sign In With Typepad" link above the comment form, you'll be directed to the Typepad sign in page where you can enter your email address and password. There check the "Remember Me" box signing in. In most cases, this will work. You can also remove the option to sign in to comment if you prefer. At Settings > Comments, set the Comment Authentication setting to No and click Save Changes. This will remove the sign in options and allow comments to be submitted without signing in. We are sorry for any inconvenience caused by this issue. As soon as we have more details about the resolution of the sign in problem for comments, we will let you know. I'll change the settings as advised, but I'm not removing sign in options because of spam. Please mail me if you keep having trouble logging in (an try the "remember me" trick in bold above). I had the problem signing in for several days, until I checked the "remember me" box (before seeing it in your comment). Since then, every time I click on sign in with TypePad, I get right to the comment box. Just thought I would relate my experience with the checking the "remember me" box. And to thank you for this blog. If you need to, take some time off to rest and recharge. Comments are now displayed in reverse chronological order, and the margins are cramped. It seems as if MYI is being set up to flush out the Fram over the next 5-6 days according to ECMWF. How much thinner can the ice get before vanishing? I normally login via Google, or Facebook, or Typepad depending on the day of the week, phase of the moon, tidal fluctuations or the last digit of yesterday's market close. And yes, the comment box disappeared for me a week or so ago. Even with the Typepad Dashboard on the page the comment box was nowhere to be found. I finally followed Twemoran's advice and cleared browser cache and cookies; didn't seem to help. It still wasn't here *this* visit when I first loaded the page. Then suddenly it was. I did click the Typepad Toolbar icon (minimizing the Dashboard, then clicked it a 2nd time bring the Dashboard back into view. None of this tells me anything about why the Comment box went away or why it came back. I hope this is as insightful for you as it wasn't for me. Hmmm, this is not good, I didn't do it. I'll wait for a day or two before asking what's going on. Maybe they're just fiddling around. Neven, Reverse order is not bad, consider it a good accident, we don't have to scroll so much for recent comments. "The coming decades will see loss, suffering, and conflict as our planetary overdraft is paid; however, they will also bring out the best humanity can offer: compassion, innovation, resilience, and adaptability... The crisis represents a rare chance to replace our addiction to growth with an ethic of sustainability, and it’s already happening. It’s also an unmatched business opportunity: Old industries will collapse while new companies will literally reshape our economy. In the aftermath of the Great Disruption, we will measure “growth” in a new way. It will mean not quantity of stuff but quality and happiness of life. Yes, there is life after shopping." That's nice, Lennart. I like to think that way as well. BTW, are you guys also seeing an 'edit' button after posting your comment? Now, that would be a good feature. I wasn't signed in automaticaly but otherise same as usual, except now i see we have a reply option[ which wasn't there when i posted] after every comment, and was thrown by the reversal, trying to get back to the previous page, before i read about it. I only posted the below once but every time i pressed delete option another clone appeared. Apparently TypePad is trying out stuff. Let's wait and see what happens. Seems like Twitter posting is restored - but I can't preview before posting. It is still an improvement. I will post the Oct 11-20 methane imagery once the IASI information is available. Thanks again to all who post here - I am indebted to the collective process which helps me articulate global climate issues in real life. "I'm still waiting till later in November and keeping an eye on Siberian snow advance before making any guesses about the winter to come." Chris, the Rutgers imagery is showing additional snowfall in Siberia and Canada that is anamolous for this as of Oct 22. That said, there are shortfalls elsewhere - like Alaska. SCE was the greatest since 1976. So here is 5 Oct 2009, and here is 25 Oct 2009. which shows the massive advance of the snow-line. Depending on weather this sort of massive advance may not happen in October, but by November it's almost inconceivable that the advance of the snowline won't have happened. Which is why I'm saying we'll know later in November whether there has been a massive advance that suggests a cold, low AO index, winter. However this is very unsatisfactory as Cohen actually examines the raw data to produce a snow advance index. So doing it by eye is little more than informing a guess. Thanks for posting the Jamstec forecasts. In September 2009 they were forecasting a partial low AO index winter pattern for the NH. By October 2009 they were forecasting pretty much what happened that winter. Yet in November 2009 they were forecasting a warm NH winter. In Cohen's 2010 paper, Winter 2009–2010: A case study of an extreme Arctic Oscillation event, the authors found 'sudden stratospheric warmings' associated with the formation of the extreme low AO and massive prolonged cold outbreaks that made 2009/10 such a savagely cold winter. It seems this has persuaded the UK Met Office. As reported by the UK's Telegraph paper, link, the UK Met Office have upgraded their model in late 2010 (Cohen 2010 was published in Sept 2010), enabling them to more correctly forecast the winter of 2010/11. That article mentions stratospheric warming events - a key part of the causal chain Cohen 2010 identifies. However as the article closes in noting - this allows the Met Office to correctly predict one class of cold winter - the extreme low AO event - but other causes of cold winters remain. One of these is low sea ice in Barents/Kara. We saw the effects of this in Europe this February. However that cold outbreak was relatively short, around 1 week, while the sea ice anomaly that caused it was protracted throughout the winter. Anyone know of other discrete mechanisms that are evidenced as having happened? The first thing that popped into my mind when I read about the Austrailians was it was warm in Baffin Bay and Greenland had a lot of runoff. That area in Baffin Bay is part of the deep water formation that feeds the deep circumpolar current. 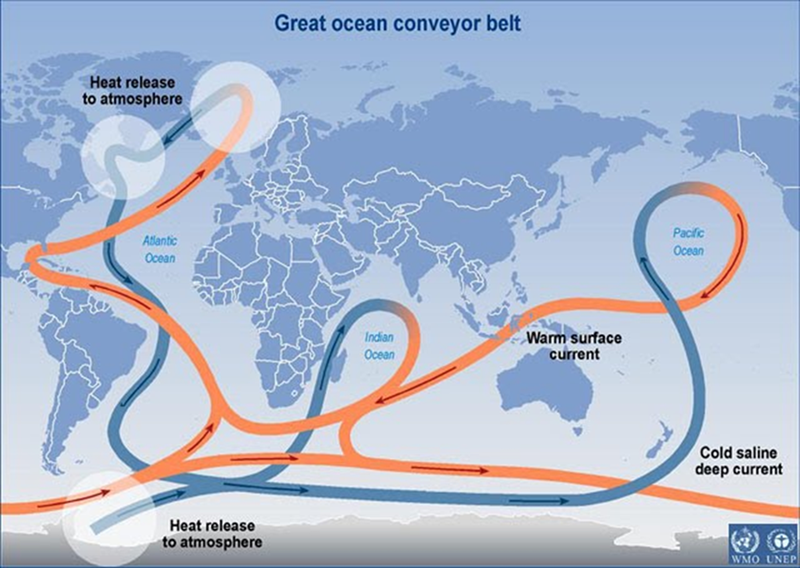 When I heard about El Nino stalling, I thought about the Humboldt Current which comes from the circumpolar current and gets disrupted by El Nino. I think the Humboldt Current is the upper circumpolar current. I don't see a connection with antarctic ice and the deep circumpolar current which slowed. There could be a connection between the upper circumpolar current speeding up with the circumpolar wind. That would change SSTs off of western South America. Ocean currents are driven by prevailing winds and thermal-haline density gradients. However, "the winds, they are a changing." This blog is about changes in sea ice - and it was the rejected brine of sea ice formation in the North Atlantic that was a primary driver of northern deep water formation and global themal-haline circulation. Arctic basin sea ice formation does not produce such cold, dense brine because the surface salinity is not as great. With limited sea ice formation in the North Atlantic, we have to assume that a major leg of our ocean circulation models is gone. In fact, the NA has become an area where large amounts of Arctic sea ice melts. Instead of making ice, the North Atlantic now melts ice. As a result of these changes, we can assume that there are ongoing changes to the global ocean circulation. It is not a matter of whether ocean circulation is changing, it is a matter of how long until it is detectable, and when practical impacts will occur. (as in do you see anything on http://www.osdpd.noaa.gov/ml/ocean/sst/anomaly.html that has persisted since 2007? The circulation models that do not see changes in sea ice or changes in atmospheric circulation will not see these changes in circulation. An early effect will be a complex pattern of regional sea level changes - going up in some places, and down in others. And, we will see rather abrupt changes in sea temperatures (surface and deep water). Have we seen any such effects? 1)	Hurricane Isabel taught us that in a time of global warming, central pressure is no longer the sole determinate of the power of a storm. 2)	Arctic cyclone 2012 had a long fetch across warm waters. Therefore, the winds carried more latent heat to melt ice than in the storms in previous years. 3)	The cyclone winds generated larger waves to break up ice than the storms in previous years. 4)	The water was warmer, and the upper atmosphere was colder, so there was more energy to drive the wind. 5)	It was sustained for a relatively long period. 6)	The ice was thinner and warmer (therefore weaker) and less able to withstand the waves. 7)	The ice had been repeatedly moved around and fractured, and was therefore weaker. In summary, the storm was a little bigger, the water was a little warmer, and the ice a little weaker, all as a result of global warming. These are different systems, affected differently by global warming. It was the feedback between the effects of global warming on three different systems (ocean, atmosphere, & ice) that made this such an extraordinary event. However, the event would not have happened without the early snow cover loss that allowed the early sea ice melt. Early snow cover loss could not have occurred without the extra heat in the temperate zones In a time of global warming, all the weather is tied together. There was a history of similar (if smaller) storms in the past, and we knew about Arctic Amplification. the event was predictable. And, we can foresee more and more powerful events. Try reading the end of this thread and maybe you will see a connection with the arctic sea ice! Read what is said about the Australians saying they detected a drop in salinity and a slowdown in the deep antarctic circumpolar current, which partially starts in Baffin Bay! Read what is said about El Nino stalling and they don't know why, because it hasn't happened before! An El Nino forecast should interest anyone interested in arctic sea ice, I know I've been watching it. Baffin Bay is part of the arctic sea ice, so if something changed there related to changes in arctic sea ice, it is relevant. I don't know where you come up with the idea that losing salinity from arctic sea ice drives thermohaline circulation. Deep currents are also part of thermohaline circulaton and they aren't driven by the wind. that I read in Science circa 1990. (http://www.wetterzentrale.de/topkarten/fsecmear.html) click N-Hem and use 500hPa,SLP 24hr, 48hr, 72hr etc. to get whatever day you need. The next several days show high pressure over CA/Greenland and low pressure over Russia/Scandanavia setting up wind fields to drive ice out the Fram. I'm not sure what I need to do to make the link work. I'm use to MSWord doing the linking automatically. Failing that, you can try using html tags to post the link (posting tips are here). The ocean water that forms the deep water current comes from the Gulf Stream and isn't dependent on salt from arctic sea ice. It just has to cool. The salinity increases with evaporation and the Atlantic has the most salinity. That's Gulf Stream water forms a deep current that joins the deep antarctic circumpolar current by deep water formations west and east of Greenland. It has high salinity and creates a deep water current by cooling. Something went on in that area with Baffin Bay having such high temperatures, Nares and Frame pumping out sea ice, Greenland melting and the salinity changes of the Arctic Ocean going up. Look how the surface salinity of the "east" arctic changed in two years! This first map doesn't show the deep circumpolar current going around Antarcitica, but it does. The Aussies detected a decrease in speed and salinity of the deep circumpolar current. It could be a push/pull kind of thing where the failed supply of a deep water current resulted in the deep circumpolar current borrowing some fresher water. I'm suggesting the cause of changes in the deep circumpolar current could be at the other pole and not because of changes in antarcitic ice. On the other tangent, I've been watching ENSO to predict how it may affect the refreeze and next year's ASI melt. El Nino was named because the Humboldt current stopped upwelling off the coast, the ocean warmed, good fishing stopped and the Peruvians switched to farming because of the good rains. This is just speculation, but could a speed up in antarctic circumpolar winds speed up the upper circumpolar current and cool the eastern Pacific changing ENSO to a more La Nina to neutral prone pattern? If that was the case and El Nino doesn't develop, I expect PDO to follow along and remain in it's negative phase. With no major shift in climate patterns, the refreeze could be similar to this year's maximum, being larger than the Northern Hemisphere sea ice maximum of 2011, but this year's maximum had less true arctic sea ice in the Barents and Kara Seas. The beginning of the 2012 melt was the latest it's been for area stats and 22 days later than 2011. The stats get the headlines, but they don't truly reflect the condition of the arctic sea ice. The arctic storm didn't just take a large chuck of sea ice away from the main body, it also took a chuck of MYI with it. Since the storm, my attention has been focused on the drift, thickness, SST and salinity, but specifically how it sets the stage for MYI melt next season. I'm particularly concerned about the CAA leaking more MYI and melting it. The spectacularly unusual confluence of events is the shape and orientation of the dip in the jet stream that is forecast to develop over eastern North America over the weekend – oriented in such a way to pull Sandy inland instead of pushing it out to sea, and the presence of a strong tropical or subtropical system where it can get pulled in. That’s so bizarrely unusual that I can’t think of another event like it. Can anyone say where can i get modern temperature data about central greenland, to continue this graph http://www.iceagenow.com/GISP2%20Ice%20Core.jpg? You can easily find a link to the comparison I mentioned on the NOAA site and cross reference with the top link to get the full report of the ice cores in question. From what I saw, you'd have to average about 6 of them to get a good average. Greenland has plenty of sites to get modern temperature data from ice cores, but at some point they even have instrumental measurements from the research going on there. The GISP2 site was chosen for past and not modern data. I have seen GISP2 charts with modern temperatures added and they seem to be consistent, but I'm not sure how they obtained the modern data. If I remember right, GISP2 starts at 95 years BP and BP is 1950. You'll want figure 1 on page 3. You're right to look for more recent data, the fact that that graph ends 95 years ago, and that it has the name Joanne Nova emblazoned on the side is indeed a strong warning that they're being 'economical with the truth'. BTW IceAgeNow is a well known crank site, again, when you see something from there approach with almost prejudicial scepticism. I should express my thanks to Leif Svalgaard - he's a solar scientist and that paper is on his site. which came out before the full extent of the 2012 season was visible. In it they looked at sea ice formation in winter in the Laptev which is (they say) one of the main formers of seasonal sea ice in the arctic. They explain that the Laptev polynyas generate a large part of arctic seaconal ice because the wind blows the continually freshformed ice from these polynays into the larger arctic basin, to accumulate or drift towards the Fram strait. Now they said that the export from the Laptev would be a key predictor of the following season´s ixe extent, because strong export meant low ice thickness - basically blown out by the wind before it could grow thick in its "babyground" Laptev. So they noted that the ice export (to the N, into the CAB) of the winter 2011-12 was off the charts strong (implying exceptionally low thickness)(p. 2907). The paper came out before the season was full - but methinks their proposed correlation has been holding quite vividly. So this might be a thing to watch in the winter: how is the seaonal ice in the marginal seas developing? Does it stay in place and grow thick? Then the following season would be not record. Or does it remain mobile, gets blown around and continually refreshed? Then one might expect a strong melt year the next year. Looking from POV of the atmosphere, one would then have to watch the wind field in the eurasian marginal seas. This link: http://www.chicagotribune.com/business/sns-rt-us-usa-climate-arcticbre89n1cu-20121024,0,7645899.story seems futile at the moment. Digging some 150 years back in time into the old mariner’s log books, from the days when ships were sunk by massive loads of Arctic ice, seems to be a disturbing detour. Referring to UK volunteers, may encourage some US citizens to celebrate separation from the UK with a lot of work in the archives. However both Dutch and Danish experiences, with trained historians doing the tedious transcription of old logbooks, shows, that this is a job for professionals. And it takes years to extract anything meaningful from a well-prepared exercise of this kind. Please make sure, that NOAA does not waste time and resources – and delays action – in an attempt to look back in more detail at a period of excessive sea ice in the Arctic, which may not come back in our life time. and a string of strong anticyclones for most of the Canadian North, which also seems to be erratic in their movements. This flank of Highs will block Hurricane Sandy from heading to the Atlantic . Also the cold temperature North Pole is consolidating North of Greenland favouring steadier weather to the South, there was two CTNP's a few days ago, now only one. The usual not so long ago weather at this time of year was the onset of winter colder atmospheres moving fast southwards twisting the jet stream to aim straight to the NE (gulf stream direction) . The current patterns happen when winter is much delayed. And winter has been much stalled as it started from a much smaller patch of Arctic ocean sea ice. That's a worry, was hoping that the cold stratosphere, and the antarctic vortex would keep the south pole a bit isolated from the warming climate. If we have to take serious warming in the south, as well as the north into account, then sea level rise gets that bit more serious.